STRAITS OF MALACCA, -- After a 7-month long deployment in the Arabian Gulf and a month-long posting to the Bay of Bengal, the US nuclear-powered aircraft carrier USS Theodore Roosevelt is due for a stopover in Singapore on Saturday (Oct 24). It will dock at Changi Naval Base as part of a routine port visit for resupply, commonly carried out by aircraft carriers and other US 7th Fleet ships while operating in the Indo-Asia-Pacific region. The strike group’s operation in the Arabian Gulf, dubbed Inherent Resolve, was part of the US-led military intervention against the Islamic State of Iraq and Syria (ISIS). “Our focus was air support for the Iraqi ground troops both on the ground in Iraq and northern Syria,” said commander of the Carrier Strike Group, Rear Admiral Roy Kelley. ISIS terrain in Iraq and Western and Eastern Syria decreased by about 25 per cent within the year that US navy aircraft carriers supported the mission, according to the commanding officer of USS Theodore Roosevelt, Captain Craig Clapperton. “Their ability to manoeuvre freely within the battle space has decreased, their ability to expand has essentially been stopped,” he added. The departure of USS Theodore Roosevelt from the Arabian Gulf this month marks the first time since 2007 that a US aircraft carrier strike group is not in the area. The US Navy is focusing on reducing its deployment lengths to alleviate stress on its carrier strike groups, and is expecting to see more of these gaps in the future. “We’ve had deployments that have been in excess of 10 months. It’s hard on the sailors, it’s hard on the ships trying to keep the maintenance up. So we are focusing on bringing them back to 7-month deployments,’’ said RADM Kelly. USS Theodore Roosevelt will be making its way back to its new home base in San Diego, and will report to the United States Pacific Command, joining USS Ronald Reagan as the second aircraft carrier in the Pacific Fleet. “We are 100 per cent combat ready, we are 100 per cent ready to assist in anything from a humanitarian assistance operation to a maritime security operation up to and including major combat operations,” Capt Clapperton said when asked about the move to the United States Fifth Fleet. 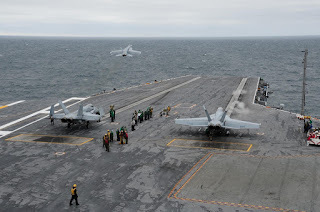 The carrier strike group entered the Straits of Malacca on Thursday, after completing a trilateral naval exercise with India and Japan in the Bay of Bengal. This is Japan’s first time participating as a permanent member of the drill. “Japan’s participation in the future is something that we can expect to continue. I don’t think that the intent of it is aimed at any particular country,” said Capt Clapperton, dimissing suggestions that the drill is a show of military might against China, amidst rising territorial disputes in the South China Sea. “The intent of the exercise is to continue to build support, continue to build relationships, and how our navies operate, make sure that we are able to continue to keep the free lanes of commerce flowing in and about the Indo-Asia Pacific region,” he said. 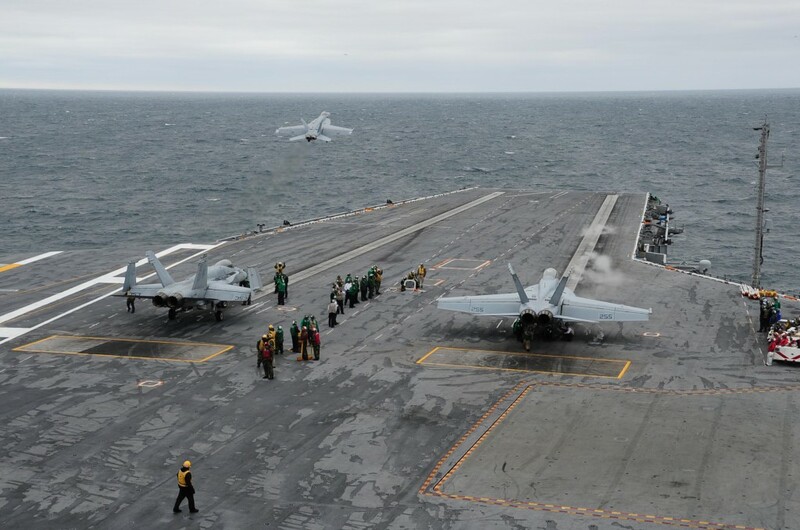 The Sailors aboard the aircraft carrier USS Theodore Roosevelt (CVN 71) complete carrier qualifications.